Many Americans have expressed dismay over the phenomenon of "Christmas Creep", where decorations and carols begin to appear earlier and earlier every year (especially in stores). This doesn't happen in traditional Ukrainian culture, where the season has very definite start and end date. And unlike the American tradition, the celebratory season starts on Christmas Day! The Christmas season in Ukraine actually consists of three holidays: the Nativity (Christmas, December 25 Gregorian/January 7 Julian), the Feast of St. Basil (January 1/14), and Theophany/Epiphany (which celebrates Christ's Baptism, January 6/19). These "Three Feasts" are mentioned often in Christmas carols, the most well-known of which is "Dobryi vechir tobi, pane hospodariu" ("A good evening to you, master of the house"), with its fourth verse: "Bo pryidut' do tebe try praznyky v hosti" ("For Three Feasts shall come to you as guests"). 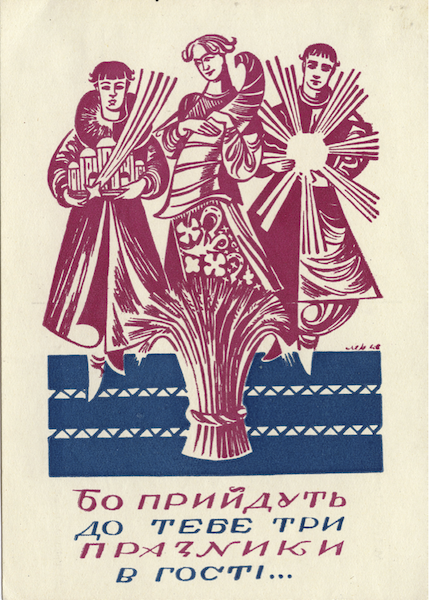 On this 1947 Christmas card, the Ukrainian artist and graphic designer Myron Levyts'kyi (1913-1993) has symbolically depicted the Three Feasts as gift-bearing guests. But the celebratory season doesn't end with Epiphany. Traditionally, caroling and other activities continue on through the feast of the Meeting (or Presentation) of the Lord (the Western "Candlemas") on February 2/15. This can be heard in this recording of a Liturgy served by the Ukrainian Catholic bishop Joseph Schmondiuk on January 22, 1961. Although the Gospel reading is of the parable of the Publican and the Pharisee, and is therefore part of the pre-Lent period of the new Paschal (Easter) Cycle (reel 2, 20:00), the choir is still singing Christmas carols (reel 4, 5:41).